As per the above figure, developers’ environment includes two developers workstation. In practice, you can take as many workstations as your development team size. As with all other sizeable new business software implementations, a successful SharePoint deployment is one that is well thought-out and carefully managed every step of the way. 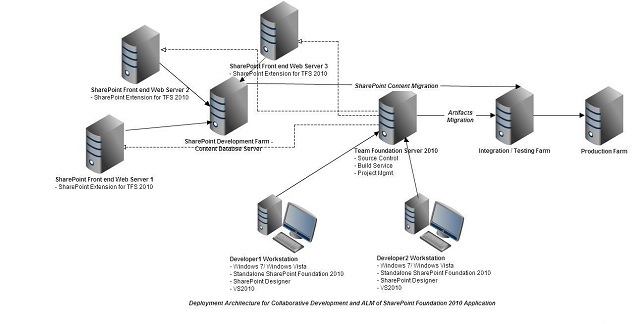 However in one key respect a SharePoint deployment is different from most others in the way it should be carried out. Whereas the majority of ERP solutions are very rigid in terms of their functionality and in the nature of the business problems they solve, SharePoint is far more of a jack-of-all-trades type of system. It’s a solution that typically spreads its tentacles across several areas within an organisation, and which has several people putting in their two cents worth about what functions SharePoint should be geared to perform. So what is the best approach? And what makes for a good SharePoint project manager? From my experience with SharePoint implementations, I would say first and foremost that a SharePoint deployment should be approached from a business perspective, rather than from a strictly technology standpoint. A SharePoint project delivered within the allotted time and budget can still fail if it’s executed without the broader business objectives in mind. If the project manager understands, and can effectively demonstrate, how SharePoint can solve the organisation’s real-world business problems and increase business value, SharePoint will be a welcome addition to the organisation’s software arsenal. Also crucial is an understanding of people. An effective SharePoint project manager understands the concerns, limitations and capabilities of those who will be using the solution once it’s implemented. No matter how technically well-executed your SharePoint implementation is, it will amount to little if hardly anyone’s using the system. The objective here is to maximise user adoption and engagement, and this can be achieved by maximising user involvement in the deployment process. Rather than only talk to managers about SharePoint and what they want from the system, also talk to those below them who will be using the product on a day-to-day basis. This means not only collaborating with, for example, the marketing director but also with the various marketing executives and co-ordinators. It means not only talking with the human resources manager but also with the HR assistant, and so on. By engaging with a wide range of (what will be) SharePoint end-users and getting them involved in the system design process, the rate of sustained user adoption will be a lot higher than it would have been otherwise. 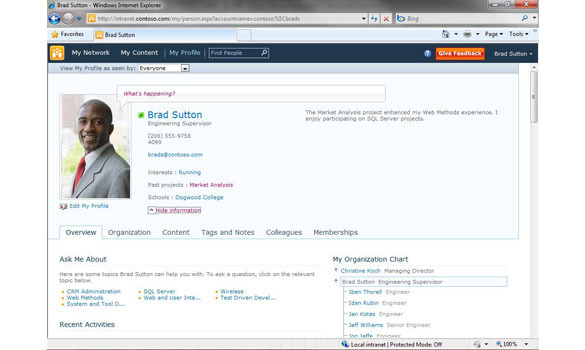 An example of user engagement in action concerns a SharePoint implementation I oversaw for an insurance company. 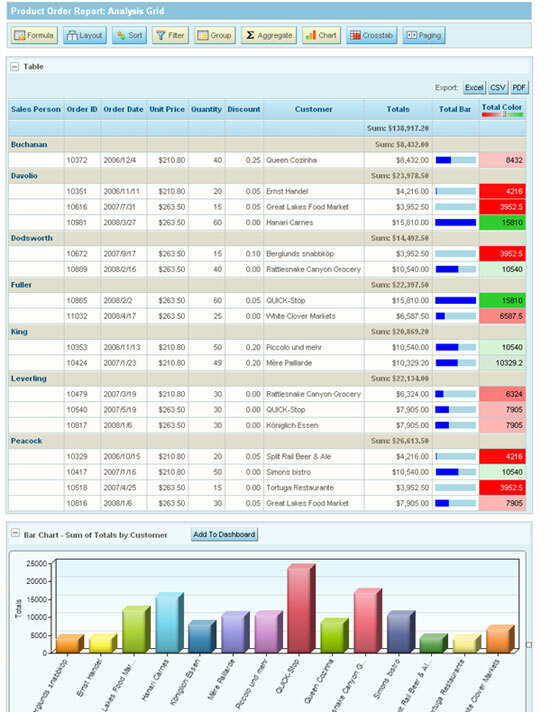 The business wanted to improve the tracking of its documentation using a SharePoint-based records management system. Essentially the system was deployed to enhance the management and flow of health insurance and other key documentation within the organisation to ensure that the company meets its compliance obligations. The project was a great success, largely because we ensured that there was a high level of end-user input right from the start. We got all the relevant managers and staff involved from the outset, we began training people on SharePoint early on and we made sure the change management part of the process was well-covered. Also, and very importantly, the business value of the project was sharply defined and clearly explained from the get-go. As everyone set about making the transition to a SharePoint-driven system, they knew why it was important to the company and why it was going to be good for them too. By contrast a follow-up SharePoint project for the company some months later was not as successful. Why? Because with that project, in which the company abandoned its existing intranet and developed a new one, the business benefits were poorly defined and were not effectively communicated to stakeholders. That particular implementation was driven by the company’s IT department which approached the project from a technical, rather than a business, perspective. User buy-in was not sought and was not achieved. When the SharePoint solution went live hardly anyone used it because they didn’t see why they should. No-one had educated them on that. That’s the danger when you don’t engage all your prospective system end-users throughout every phase of a SharePoint implementation project. As can be seen, while it is of course critical that the technical necessities of a SharePoint deployment be met, that’s only part of the picture. Without people using the system, or with people using the system to less than its maximum potential, the return on your SharePoint investment will never materialize. Comprehensive engagement with all stakeholders, that’s where the other part of the picture comes in. That’s where a return on investment, an investment of time and effort, will most assuredly be achieved. Instrumenting your application code should be one of the key Non-Functional Requirements for consideration while building applications in Azure, specifically if they are multi-tenant SaaS-based applications. /// Log a message object with the Fatal level. In addition to logging the exceptions caught in the catch block, it is a good idea to provide support for verbose logging and enable it for capturing detailed code flow if needed. To capture verbose log, you must instrument every method entry, including the parameters passed and return values. Important business rules within methods should also be instrumented as deemed necessary. You can use the Info method to create specific logging entries such as “Method Entry”, “Method Exit” with each of these entries augmented by the parameters passed and returned respectively. 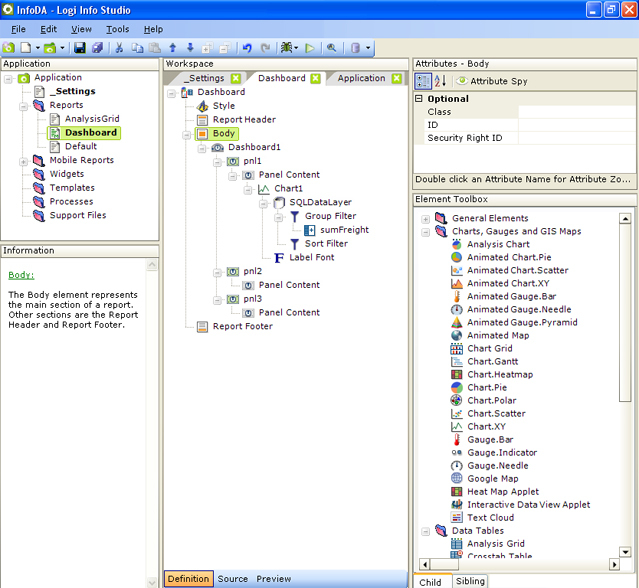 Note that Windows events are captured and logged in the WADLogsTable and WADWindowsEventsLogsTable table stores. They provide additional diagnostic information into issues occurring in the configured roles. Performance metrics are usually twofold. You can use the Telemetry SDK to create custom KPI to be monitored using App Insights. If you do not have App Insights, you can actually create a simple performance monitor for your modules, using a StopWatch and capturing the ElapsedMilliseconds for the operations you intend to participate in a performance session. The key here would be, however, to be asynchronous while capturing performance data. The following class shows a simple PerfLog entity. 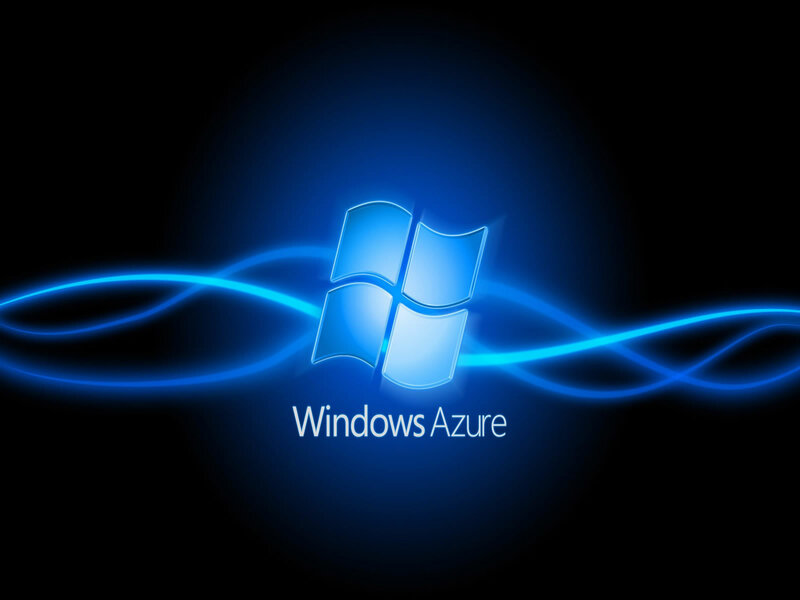 Second, you can use the Windows Azure Performance Diagnostics part of Windows Azure Diagnostics (WAD) to create and use performance counters in your application. The WAD framework is built using the Event Tracing for Windows (ETW) framework and the performance counter logs are stored in the WADPerformanceCountersTable storage table. It is possible to create a custom diagnostic plan for each role using Visual Studio. The following figure illustrates the performance configuration. If you are building a multi-tenant SaaS-based application, Service Metering is important to gain an understanding of usage and bill customers accordingly. The recently released Cloud Design Patterns guidance by the Patterns and Practices team elaborates on the Service Metering Guidance. Please note that there is no default mechanism in Azure to perform metering by tenant. The architecture needs to take care of tenant-based metering. An early example of this was released in the Cloud Ninja Metering Block and you can explore the source to understand a tenant metering implementation and apply it in your application. The source is available at http://cnmb.codeplex.com/SourceControl/latest. We incorporated feedback we received for the .NET Framework 4.5.1 from different feedback sources to provide a faster release cadence. In this blog post we will talk about some of the new features we are delivering in the .NET Framework 4.5.2. High DPI Improvements is an opt-in feature toenable resizing according to the system DPI settings for several glyphs or icons for the following Windows Forms controls: DataGridView, ComboBox, ToolStripComboBox, ToolStripMenuItem and Cursor. Here are examples of before and after views once this change is opted into. The red error glyph barely shows up and will eventually disappear with high scaling The red error glyph scales correctly. Distributed transactions enhancement enables promotion of local transactions to Microsoft Distributed Transaction Coordinator (MSDTC) transactions without the use of another application domain or unmanaged code. This has a significant positive impact on the performance of distributed transactions. More robust profiling with new profiling APIs that require dependent assemblies that are injected by the profiler to be loadable immediately, instead of being loaded after the app is fully initialized. This change does not affect users of the existing ICorProfiler APIs. Before this feature, diagnostics tools that do IL instrumentation via profiling API could cause unhandled exceptions to be thrown, unexpectedly terminating the process. Improved activity tracing support in runtime and framework – The .NET Framework 4.5.2 enables out-of-process, Event Tracing for Windows (ETW)-based activity tracing for a larger surface area. This enables Application Performance Management vendors to provide lightweight tools that accurately track the costs of individual requests and activities that cross threads. These events are raised only when ETW controllers enable them. For more information on usage of these features please refer to “What’s New in the .NET Framework 4.5.2”. Besides these features, there are many reliability and performance improvements across different areas of the .NET Framework. .NET Framework 4.5.2 Web Installer – A Bootstrapper that pulls in components based on the target OS/platform specs on which the .NET Framework is being deployed. Internet access is required. .NET Framework 4.5.2 Offline Installer – The Full Package for offline deployments. Internet access is not required. 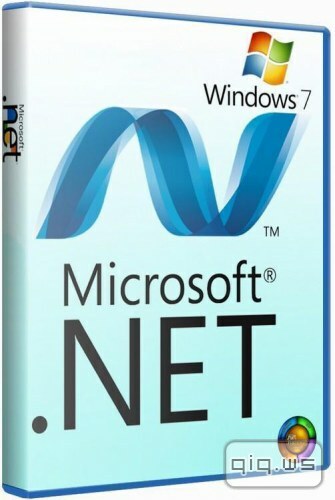 .NET Framework 4.5.2 Language Packs – Language specific support. You need to install the .NET Framework (language neutral) package before installing one or more language packs. 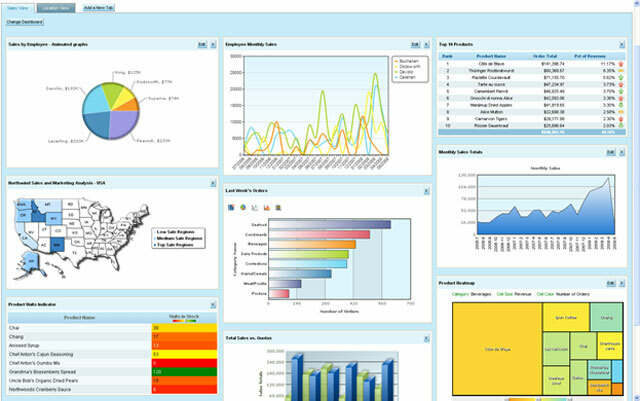 This project is to develop an interation planning tool for agile project management. Release: 1.0.0, run in Visual Studio integrated mode. See how to use for details. This tool is for agile project teams, who currently are using sticky notes on the wall. With this tool stories, backlog and iterations are managed in a graphic designer, saved as files within visual studio projects and can be exported to images, reports and etc. Run the windows installer AgilePlanner.msi (requires elevated command prompt under Vista and administrator on XP/2003). You will be presented a designing environment like below. Notice: the capacity of iteration updated automatically after dragged stories between iterations and after updated the stories’ capacity property, so that you can balance the work load between iterations. The stories can be colored based on either their status or priority. To switch between these two options, right click the diagram and select menu “Color on Status” or “Color on Priority”. 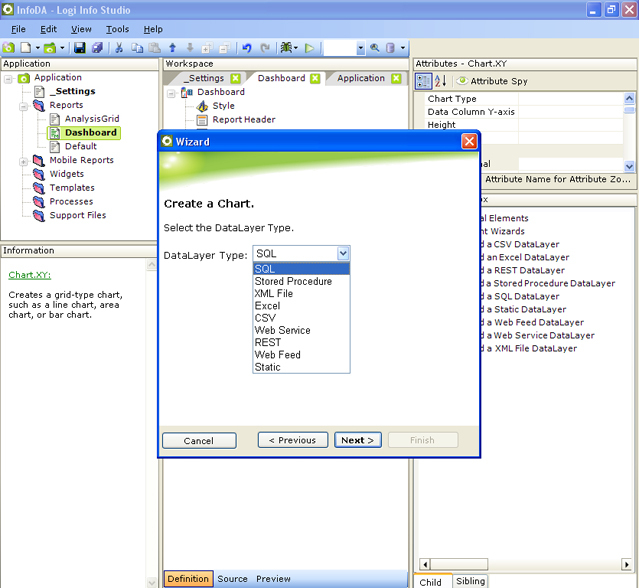 The color schema are customizable as the property of the project. The rendered diagram can be exported to png file by right clicking on the diagram and select menu “Export to image”. Mark Twain wasn’t a Software Development manager in any way; however, his words still resonate very accurately when it comes to how you can get started adopting Agile project management techniques. Here are the top 5 practices you can use TODAY regardless of your situation or environment. 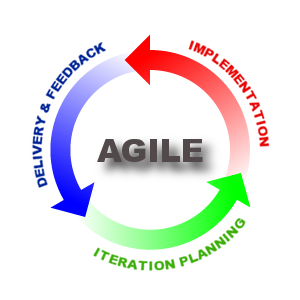 1.Don’t call it “Agile” – The term Agile seems to have become fatigued or simply over/misused. In some organizations it even has negative connotations – synonymous with “developer centric” or “no documentation” or “no requirements.” This is not the intent of Agile. In addition, sometimes the term “Agile” conjures up dogma– a religious like push to have an “all or nothing” adoption of all things “Agile”. In many cases, this simply isn’t reality. Ultimately we adopt “Agile” project management practices to help control chaos and more importantly, reduce waste by helping us focus on the production of business value. The term “Agile” sometimes conjures up a nebulous end-state that seems unachievable or unpractical to a lot of organizations. 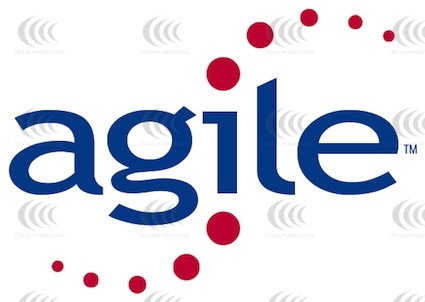 So, why call it Agile? The goal of adopting any practice is virtually the same – to minimize waste. You don’t need to label any of these practices with “Agile” if you don’t want to and still get tremendous value. 2.Time-boxed High-Bandwidth Communication Cadences – The term “High Bandwidth” is used for a reason. Part of “Agile” is an acknowledgement that humans communicate more effectively when they are face-to-face – other forms being wasteful. We like face-to-face discussions – body language, facial expressions, and interactive conversation all add to the effectiveness of this form collaboration. Given this, you should start to sprinkle in regular cadences of high-bandwidth communication across your project. To make this even more effective, consider placing a time-box around these sessions to make sure everyone stays focused. Don’t mistake this with “have more meetings” – implementing this correctly results in having less more effective meetings focusing on greater team communication. Start with a daily 15 minute “standup” meeting where the team simply acknowledges what they are working on and if they are having any problems. Next, sprinkle in a bi-weekly “show-and-tell” to show off what was accomplished during that time period with your customers. If you can’t meet face to face, then think about other forms of higher bandwidth communication such as video chat with Skype or Lync. Try to NOT rely upon email for your primary form of discussion as meaning and intent are quickly lost or misinterpreted the more you rely upon written words for communication. 3.Be Visible: Find a way to simply and effectively communicate the current state of work. I might stress that this is not a 50 page print out of your Microsoft Project Gantt chart – but a very simple, highly visible board that shows what people are working on. This doesn’t need to be electronic and could be as simple as sticky notes on a whiteboard. There are lots and lots of examples of this – yet, you should start off with something simple to create and more importantly, simple to maintain and update. 4.Regular Checkup: The term “Post Mortem” is a horrible term. It means to investigate something after it is dead. Instead of using an autopsy to drive organizational learning why not have a “regular checkup” to make sure you are doing all that you can to keep the project and team healthy? This doesn’t need to be formal – it can be as easy as a “pizza Friday” on the last Friday of a month where the team gets together to chat about what they think is going well, and what they know needs fixing. 5.Define Done: Instead of having arbitrary numbers that represent the of “done” something is, create a checklist that you and your team agrees define exactly what it means to be “done” a task of different types. You can have a “done” checklist for your analysis tasks as well as any other step in the development process. Checklists are very easy to produce and should start off very simple. You can use your regular checkup meetings to add or remove items from your checklists to continue to capture team learning and improve consistency across your project and team members. Despite trying to achieve simplicity, Agile teams may still run across difficult issues. In this section some of the more common challenges are explored. It is not uncommon for a team to have incomplete work at the end of an iteration. Unfinished work is an important issue to identify as it signals a potential problem with one or more aspects of the team. When an iteration is planned, the team sets an expectation with the customer. When those expectations are not met, the customer could lose faith in the team’s ability to deliver, which introduces conditions that make success less achievable. Unfinished work should always be analyzed by the team during every iteration retrospective. This is where the team can better understand why the work was not completed and is likewise an opportunity to chart a better course going forward. There are only a few things that teams can do to manage unfinished work. First, the team can move the work forward into the next iteration. This is normally done with work that has been started and is close to completion. Work that is not done—and was not even started— is usually moved back to the main backlog and is prioritized and rescheduled with the rest of the backlog items. Incomplete work normally does not count towards team velocity, however, some teams like to have an earned value approach. Most teams only factor in completed work when calculating velocity since one of the reasons work may be left incomplete is because more was scheduled in the iteration than its capacity allowed. Teams should avoid extending the duration of an iteration to finish incomplete work. To reinforce the hard stop, some teams end iterations mid-week to reduce the temptation of using weekends as iteration buffers. Strict time boxing of iterations is an important tool in helping the team produce more predictable and repeatable results. If work does not fit within an iteration, the team should take the opportunity to assess the reason why so they can eliminate such issues in future iterations. Bugs are a different type of requirement, one the team does not value. Bugs are waste in the eyes of an Agile team. Any time spent fixing a bug is time taken away from producing customer value, and is one of the reasons Agile teams strive for “zero defect” products. Nevertheless, bugs are an inevitable and must be addressed by all Agile teams. But being unpredictable, they cannot be planned as consistently as requirements from an iterative perspective. Perhaps the most common way to handle bugs on a project is to allocate a particular amount of capacity in the iteration toward fixing bugs. Obviously, iterations early in the project will not need the same bug-fixing allocation as an iteration immediately preceding a production release, so this allocation should be adjusted by the team over time. It is very difficult for even the most experienced Agile team to forecast bugs and predetermine how they will affect the time allocation in an iteration. Consequently, bugs are pulled into each iteration’s bug allocation based on its priority and impact. Since critical bugs can manifest daily, the bug backlog must also be managed daily, a process more commonly known as bug triage. Bug resolution is also very difficult to estimate since teams usually have to work to reproduce bugs and research the root cause before any time estimate for a bug can be made. Every project will contain a degree of uncertainty. Agile teams encounter technical uncertainty (what technology, approach, or design to employ), as well as uncertain requirements. Uncertainty is usually resolved through a combination of experimentation and further research. Agile teams work to address uncertainty with a “spike.” Like almost all things on an Agile project, a spike is a timeboxed amount of time dedicated to addressing an uncertainty. For example, an Agile team may not know the correct approach for a certain technical problem or integration. In this case, the team will schedule a spike time boxed to 3 or 4 hours, where one or more members of the team would perform further research or experimentation required to help resolve the uncertainty. Spikes are scheduled in the iteration as any other requirement and decomposed into tasks accordingly. Some teams who adopt Agile struggle with process design which of necessity allocates meeting time to maximize communication and collaboration within an iteration. It can be tempting to skip these meetings to instead complete work, but beware. This can have a detrimental impact on the end result and hamper the team’s ability to achieve its project goals. Many teams choose to stop doing iteration retrospectives, which are meetings held at the end of an iteration where the team gets together and openly share what they believe went well, and specifically, what needs improvement. Retrospective meetings are perhaps the most important part of any Agile process as they are a direct conduit to delivering customer value more effectively. In fact, the retrospective meetings and the process improvement ideas that result in action are exactly what makes the team “agile.” Retrospective meetings are the critical mechanism to help drive continual and ongoing process improvement on a team. Another potential meeting casualty is the daily standup, known in the Scrum methodology, as the Daily Scrum. The daily standup is typically held at the same time and location every single day and is strictly time-boxed. Each member of the team answers three questions. Are there any problems that are getting in your way? Daily standups provide a mechanism to ensure that each team member has an understanding of what work has been done and what work remains. Daily standups are not status meetings and they are not meant to inspire discussion or problem solving – they are a mechanism for the team to share state and to uncover problems inhibiting their ability to achieve their goal. Another version of the daily standup focuses more on the flow of work rather than individual inhibitors. Instead of the team answering the three questions above, the team looks at each of the items that are in progress and quickly discusses what can be done to usher the items through the workflow. Again, the daily standup is an extremely important tool for teams to help identify issues during the development process providing the team with the opportunity to remove those issues before they impact delivery. Without these meetings teams can easily miss opportunities to resolve issues as quickly as possible. Another critical meeting is the iteration review meeting. During these meetings the team meets with the product owner to demonstrate what was accomplished during the iteration. This meeting is simply a demonstration rather than a presentation. During this review meeting, the project is assessed against the iteration goal that was determined during the iteration planning meeting. This meeting is a critical feedback loop with the team. Neglecting to perform this meeting means that valuable feedback is ignored. Some teams feel that they haven’t produced enough during an iteration to warrant an iteration review. However, Agile teams strive to get feedback on everything they produce as quickly and as early as possible to help ensure the appropriate value is being targeted and delivered. These are essential if the team is to make beneficial course corrections that may come out of the review meetings. Perhaps one of the most important meetings of an Agile team is the iteration planning meeting. During the iteration planning meeting the business sponsor/users (referred to as the Product Owner in Scrum) describes the highest priority features to the entire team. The team has the ability to ask questions so that they can appropriately define the work they need to accomplish. In addition, during this meeting the team will help determine the goal for the iteration, helping to drive decision making and focus during the iteration. The iteration planning meeting is critical for a number of reasons. First, it helps ensure that the entire team has a crystal clear understanding of the user requirements. It facilitates direct interaction with the users instead of relying upon documentation alone for the information transfer. Without this forum for communication and alignment, there is a strong chance the team will misunderstand project requirements. This cascades to poor decomposition of work, poor sizing and estimation, and most importantly, the team risks missing the opportunity to provide optimum value possible to its users.